This cheesecake is so easy to make and it tastes heavenly! 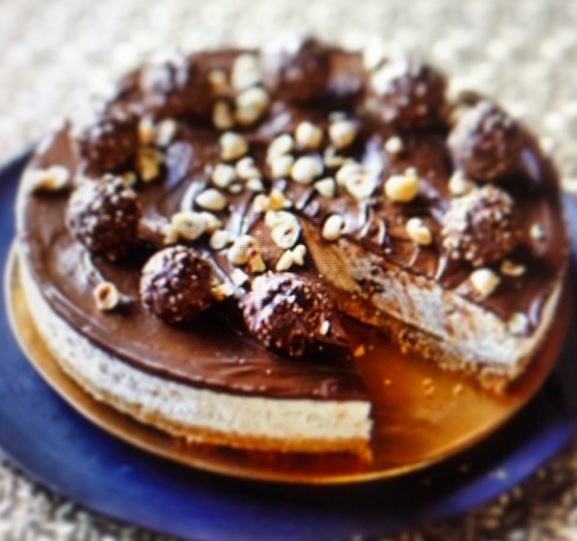 It has a gorgeous buttery biscuit base, with a creamy mousse filling which is speckled with chopped Ferrero Rocher and is topped with a layer of Nutella and decorated with roasted hazelnuts. A very decadent dessert that’s perfect for simply any occasion. The only difficult part of this recipe is waiting for the cheesecake to set, but once you’ve had a slice of it you’ll find it really hard to stop eating it! To make the cheesecake base: Melt the butter in a small saucepan or in a microwave. Blitz the biscuits in a food processor to a fine crumb. Add the melted butter and mix until well combined. Tip the biscuit crumbs into a 23cm springform cake tin and press down until compact and firm. Use the back of a spoon or glass to smooth over, place in the fridge to chill whilst you make the filling. To make the cheesecake filling: In a medium mixing bowl beat together the cream cheese with the icing sugar until smooth. In another mixing bowl whisk together the cream and vanilla until soft peaks form. Fold the cream into the cream cheese mix. Finally, fold through the chopped chocolates. Spoon over the biscuit base and smooth over with a spatula or palette knife. Cover and leave the cheesecake to chill in the fridge for at least 6 hours or overnight. Once the cheesecake has set, place the chocolate hazelnut spread in a small saucepan and melt over a low heat for 3-4 minutes until runny – be careful not to boil the Nutella or get it too hot. Allow the Nutella to cool slightly before spreading or drizzling over the top of the cheesecake. Finish by decorating with the remaining chocolates and some chopped roasted hazelnuts. Serve chilled. Cheesecake will store covered in the fridge for up to 3 days. 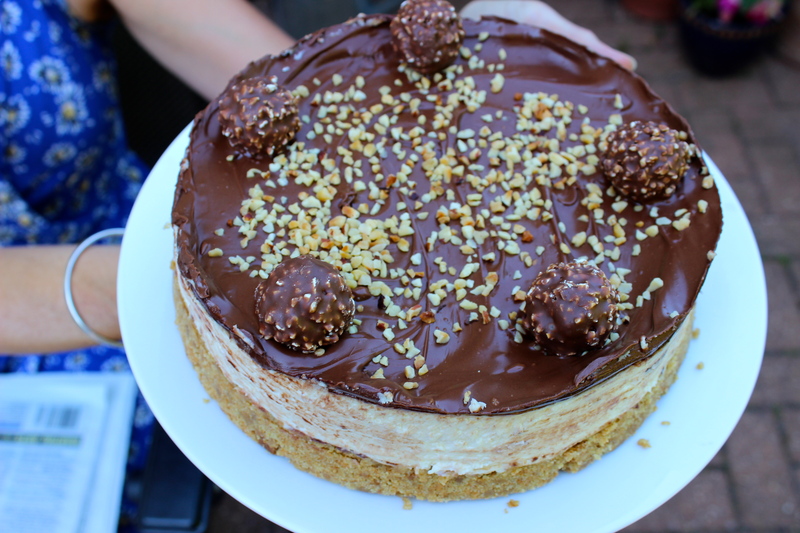 You can add more chopped Ferrero Rocher to the cheesecake filling. If you like your cheesecake sweeter, feel free to add more icing sugar to the cheesecake filling. I recommend adding around 150g instead of 85g. Check by tasting and adding more until it reaches your desired sweetness. For the Nutella topping, I typically use 4-6 heaped tablespoons of Nutella. I find using 6 heaped tablespoons makes the topping easier to spread and makes sure there’s enough to completely cover the top. This recipe of mine was proudly featured in BBC Good Food magazine May 2014 and also available on BBC Good Food website.